Visual Processing can result in overactive sensitivity to sights or an under-responsiveness to all that the eye sees. 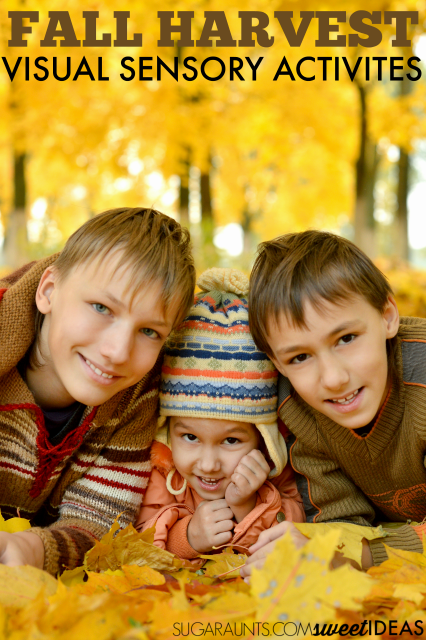 During Fall, there are many more colors and visual sights that can be a sense of interest to children with sensory processing disorders. A simple walk in the yard is much different during the Fall months when leaves are changing or there are more sticks and acorns to navigate on the lawn. For the child who has sensory processing concerns, using the sense of sight can be a calming or alerting tool. 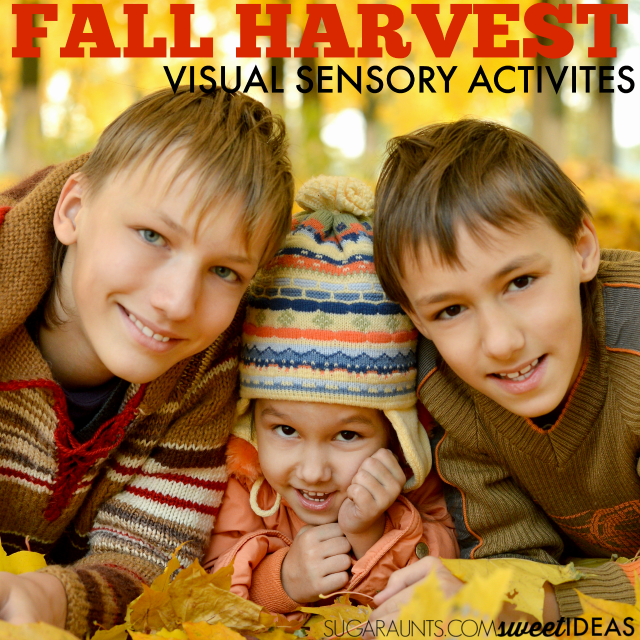 Try these fall visual processing sensory activities this Fall. Adding visual sensory activities to vestibular or proprioception activities can have a great affect on children with sensory processing disorders. Check out our Fall Proprioception Activities and Fall Vestibular Activities or find all of the ideas in one place in our Fall Harvest Sensory calendar. 1. Leaf Lay- Head outdoors on a bright and sunny fall day. Look for trees with brightly colored leaves and lay down on the ground under the tree. Kids can look up at the leaves as the sun shines through the colored leaves. Ask kids to notice branches in the leaves. Address deep breathing and slow counting for a calming sensory experience. Use this opportunity to discuss events that lead up to feelings of fear or anxiety related to the senses. 2. Color Assessment- Use a magnifying glass to explore the colors of leaves, tree trunks, and nature finds while out on a nature hunt. Kids can look for each color of the rainbow in a scavenger hunt type of activity. This fall activity builds visual scanning needed for reading and writing. 3. Pumpkin Seed Colors- Use dry seeds from a pumpkin to create colorful seeds using liquid food coloring or liquid water colors. While these seeds won’t be edible, they are great for creative play! Use the seeds to sort, manipulate, and create in Fall themed learning and play or artwork. 4. Fall Maze- Many farms or community events host a corn or hay maze this time of year. Walking through a maze is a visual processing experience that kids can use to develop directionality needs. You can create your own backyard version of a fall maze using fallen leaves or a trail of sticks from trees.